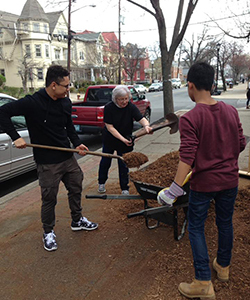 Each Good Friday members of the Church of the Holy Spirit go beyond its four walls to fulfill service opportunities in the Hunterdon County community. The Confirmands participate in activities at Cristo Rey with Padre Pozo and teens from that parish. There are also teams working at Good News Home for Women, Country Arch Care Center, and Family Promise to make repairs, paint or spruce up the grounds. In addition, there are projects around the church property and the Narthex is filled with the sound of sewing machines. Commissioning of all volunteers is followed by a continental breakfast provided by the Vestry. The day concludes back at the church with a soup supper and time to chat about the day's activities. Our church tradition started in 1990, making the day special by serving others on Good Friday. Nearly 200 men, women and children from Holy Spirit (and their friends) work in small groups in the community to paint, repair, do gardening or office work, clean up, visit and otherwise serve others. ​In the past we have helped senior citizens by doing yard clean up, visited residents at nursing homes, created quilts for the Linus Project, helped as needed at Anderson House, Good News Home, Christ Church in Trenton, and the Frenchtown Manor. Be a part of that tradition. ​Think ahead! Mark your calendar for Good Friday, April 14, 2017, so that you can be a part of this special day.